The Boston Bombing: What Happened Next? FOR DAY 1 RECAPS OF THE BOSTON BOMBING GO HERE ➤ The Boston Bombing: What Happened? I’m sorry, what? What about that third explosion heard yesterday? What about the controlled detonation across from the library yesterday? What? Apparently the media didn’t buy it and continued to report that an alleged five additional, undetonated explosive devices had been found throughout the Boston area as of the 16th. Meanwhile, officials stuck with the story adding that there were no known additional threats. Two victims that died during the bomb explosions were identified: Martin Richard, 8 and Krystle Campbell, a restaurant manager in Arlington. US Homeland security secretary Janet Napolitano stated that the bombings did not appear to be part of a larger plot. And both US law enforcement AND Saudi embassy officials announced the Saudi national in the hospital (remember him, his apartment was raided and roommates “interviewed” for 5 hours) was not a suspect. Great. Does he get his stuff back? Eh. Could be. But isn’t it stretching it a bit to say this guy is the bomber just because of one white square on one backpack? I only say that because, based on the number of people that attended the marathon and who may have also carried a black backpack (and no, I don’t have those numbers), it seems likely there may have been other backpacks like the one above. Now don’t get me wrong, 1. Sometimes pictures can be very deceiving and perhaps at this moment in time I am not seeing the angles correctly in the picture and 2. 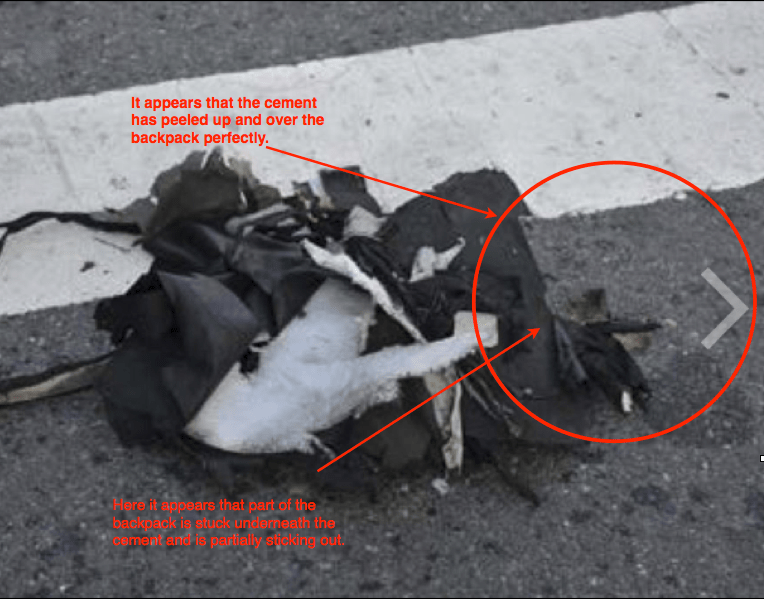 Cement, pavement, asphalt (whatever that material is) may very well behave like that when a bomb goes off. I have no idea. I am not an expert. It doesn’t seem normal but then again I can’t remember the last time I chatted it up with friends at dinner, one of whom just happened to be a forensics expert specializing in bombs, discussing cement’s post-bomb trauma. Oh right. That would be never. But if I was to throw caution to the wind and say that this behavior on the cement’s part is perfectly normal under these circumstances, then I would be forced to ask why there are no explosion marks on the ground around the bag? Of course one could say that the bag was moved prior to this photo being taken. Absolutely. But then the cement would not appear to flap over the bag. I have no answers. And again, perhaps it’s my eyes playing tricks on me or perhaps an exploding bag would not leave any marks around it. After the release of these photos, the FBI continued to ask the public for their help by turning over any video of the marathan, pictures and the like. April 16th is also the day of the Waco explosion. 14 people were killed in the explosion, 10 of them being first responders. And America’s response? Uh…just about nothing except, “Oh my god, now this? After Boston? Oh…my…god.” Oh, and this: “They better fry those Boston bombers good and long.” Folks, this is about the time I get snarky. There is nothing more amazing than watching an entire country flabbergasted at what appears to be a terrorist attack right here in the States while they say nothing about a massive explosion that killed MORE people, again, right here in the States. And that explosion was caused by fellow Americans who, in my opinion, should have cared more about their fellow neighbors (including a nursing home) than some *terrorist* who possibly has a beef against the United States. Just saying. The third bombing victim’s name is revealed. Lu Lingzi was a Chinese nationalist and a graduate student at Boston University. By the start of the day only two victims remained in critical condition at Boston Medical. And yes, April 17 is the day that President Obama and the US Senate received “suspicious packages.” Preliminary tests done on the letter sent to Obama tested positive for ricin and the letters were signed, “I am KC and I approve this message.” Am I the only one that thinks of chicken when I see this? Officials originally reported that there was no link to the ricin letter and the Boston marathon and later tests showed that the package tested negative. Yahoo News wrote, “The official who spoke to the AP about someone being taken into custody stood by the information even after it was disputed. Hmm…? After all the shenanigans, US Attorney Carment Ortiz announced that a press conference scheduled for later in the day would be cancelled due to the bomb scare. “The pressure cooker lid was found atop the Charlesmark Hotel, close to the marathon finish line where the bombs were placed, said owner Mark Hagopian. The man, from Portland, Oregon, had already been told to leave the rooftop, six floors above the street level, after police spotted him there on the morning of the marathon, Hagopian added. ‘Police told us to clear it,’ he said. The guest, whose girlfriend was running the race, returned however. And just after the bombs exploded on Monday he found what he thought was the hub of a car wheel and handed it to police. Okay, what? So this guy was on the roof before the bomb went off and was told to leave? And then he went back to the roof after the first explosion? Or was he spotted on the roof after the first explosion and was told to leave – but clearly whoever told him to leave didn’t make sure he did, indeed, leave. And if he initially left and then came back – why wasn’t the door locked behind him the first time he left? And no, this isn’t the guy that was spotted in the picture on top of the roof. That man, I believe, was on top of a building located at 755 Boylston Street. It’s the same building that has the Starbucks in it on the first floor and appears to have apartments on the upper floors. Later on in the evening, fans attending the Boston Bruins and Boston Red Sox games were told they are not allowed to bring backpacks into the events.